Deteriorating friendships, job performance and home life. An unrealistic levels of happiness from spending more time online. Feeling angry of depressed when unable to be online. Lying about internet habits or feeling guilty. Internet addiction affects 1 in 8 Americans. Internet addicts can experience 10-20% surface are brain shrinkage (image similar to cocaine or alcohol addiction). Do you own the book “Twitterature”? It’s available on Amazon or you can checkout the publisher’s website here. Have you reserved a Twitter handle for your unborn child, even though you are not even dating anyone? Perhaps, you have a handle for your pet. 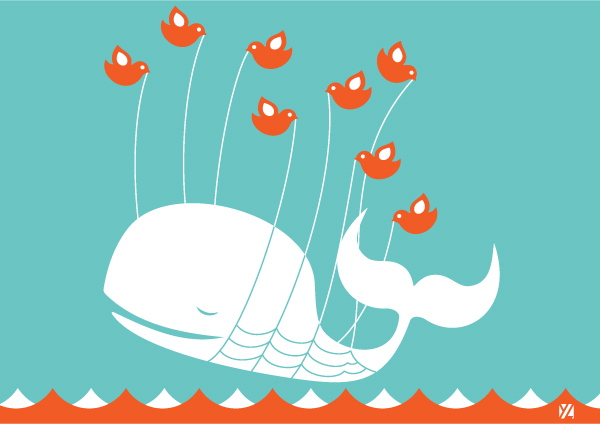 Do you know what the Fail Whale is? Extra point if you own a customized mug or t-shirt? If you don’t know — the “Fail Whale” is an illustration of a white beluga whale held up by a flock of birds, originally named “Lifting a Dreamer”, was illustrated by Australian artist Yiying Lu. It was used during periods of downtime by the social networking service Twitter. When Twitter gets overloaded, users see the above error message. How you manage your addiction before it gets out of hand? Add social media to your schedule just like you would going to dinner or going to the gym. Remove all your “fake friends”. It’s easy, just answer the following question — Is this a person you would call on the phone? If the answer is no, don’t add them. Limit your social networks to the most important in your life. Set a timer with an alarm to alert you to move on to something else. Un-subscribe from notifications. They are very distracting, especially if you are in the habit of checking, every time you get one. Uninstall Facebook, Google+ and Twitter from your mobile phone (as an example). The average internet user can get online via three different devices. Limit your access to one or two devices. Bad Posture – Extensive reading off a computer screen tends to lead to hunching and other bad posture habits. Sleep Deprivation – Many people check their social media after they get into bed. The average American only sleeps 6 hours, when 7-9 is recommend. The famous psychiatrist Carl Jung said “Every form of addiction is bad, no matter whether the narcotic be alcohol or morphine or idealism”. Internet addiction is not currently classified a s a mental health disorder, so it is unlikely your insure will cover Internet addiction. The American Psychiatric Association has recommended more research on this subject, so this could change. Next postIs someone else’s Alcoholism (or addiction) making you sick?